Born, 29 November 1818 in Alloa, Scotland; died 9 May 1880 in Toronto, Ontario. George Brown, owner of Toronto's Globe newspaper, was the "Voice of Upper Canada," a leader in the Reform party, and the most determined proponent of constitutional change. Following his election to the Canadian legislature at the age of 33, Brown’s 15-year public career forms one long campaign for constitutional reform, a battle he fought enthusiastically and with every weapon to hand. More than any other, Brown disrupted the old Canadian Union joining Ontario and Quebec under a single legislature, insisting on constitutional reform at a time when others denied the need for change. First demanding representation by population on behalf of growing Upper Canada, Brown later pushed for a federalist solution to Canada's constitutional problems, culminating in the creation of the 1864 constitutional committee that led to formation of the Great Coalition. Although strongly partisan in his methods, since at least 1860 Brown had been extending an open hand to his political opponents – recognizing that constitutional change would require cross-party agreement, and offering to support any government pledged to a comprehensive scheme of reform. For more on Brown, see the Dictionary of Canadian Biography. The Macdonald-Laurier Institute is pleased to showcase the first paper of its Confederation Series. 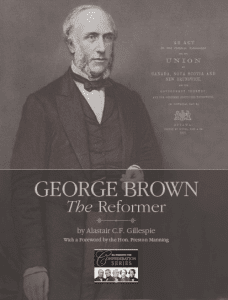 Authored by MLI Munk Senior Fellow Alastair Gillespie, with an introduction by former Reform Party leader Preston Manning, this paper offers a unique look at George Brown’s role in the birth of Confederation. The paper traces Brown's 15-year campaign for constitutional change, the record of a spirited partisan who sacrificed his own career, and laid partisanship aside, to secure a new federal constitution for Canada. To read the full paper, titled “George Brown: The Reformer,” click here.